Be my witness, mate, he said, I didn’t always look like this. How often have we been in this situation? All the details in this poem are closely observed and we’re taken right into the heart of the meaning of looking for meaning in garden centres on a Sunday: ‘Everywhere you look there’s another form of life.’ The more you read this poem the further you go into extracting some kind of meaning for life itself. And this is, surely, what poetry is about? The serious drinking starts as the last Open Mic lot are leaving. My favourite poem in this book is “Girl with a cello on the metro”. I wanted to know this girl who stepped out of the tube on to a platform to be lost forever – except that she’s not as she’s caught in this poem but will she ever know? And all her music carrying on her back. Constantine’s poems are about moments. He has a natural gift for observing moments in time and recording them. Here he is concerned with the here and now, the strangers we meet who leave a lasting impression on us and lives in fleeting moments. There is interesting syntax here and I had to read and re-read the poem to get the gist of it; but it is a fine poem. Constantine’s clever use of syntax engages the reader in a dialogue. I feel sure that the translating that Constantine and his wife have done must have influenced the way he writes in English, adding another dimension to his work. From pores all over, leaf. 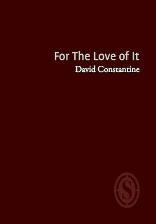 The book demonstrates what a skilful and accomplished poet Constantine is. Not many poets have the gift for expressing detail in a deceptively simple way. The poems are pictorial stories written in poetry with sharp visual images. He shares his personal places and thoughts with his reader. I had to Google the title “The Marazion Man” to discover what it meant. I knew Marazion is a place in Cornwall. According to the newspaper it is the story of man who murdered his partner by chopping her into pieces and then flushed her down the toilet. The newspaper article noted, ‘he was convicted of murder!’. In spite of this cruel story this is a beautiful poem about loss and tenderness. And how they managed was their own affair. This chapbook is full of sharp visual images. Constantine demonstrates that there is meaning in everything and we should try to let little escape our notice. Of course, in reality some things do go by unnoticed; but we should take heart in the insignificant moments as well as the bigger picture. The final poem in the book, “Borderlines”, seeks refuge in the boundary between life and death. This is a thought-provoking collection of accessible poems, uplifting to read in this fragmented world that we live in today.